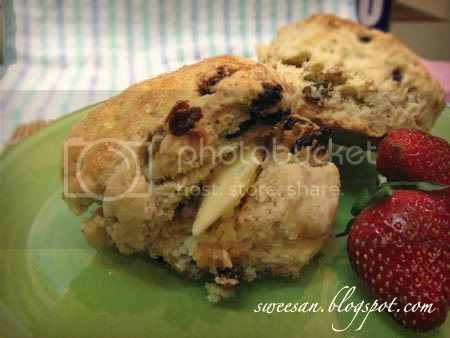 The scone is a small British quickbread (or cake if recipe includes sugar) of Scottish origin. Scones are especially popular in the United Kingdom, Australia, New Zealand, Ireland and Canada, but are eaten in many other countries. They are usually made of wheat, barley or oatmeal, with baking powder as a leavening agent. 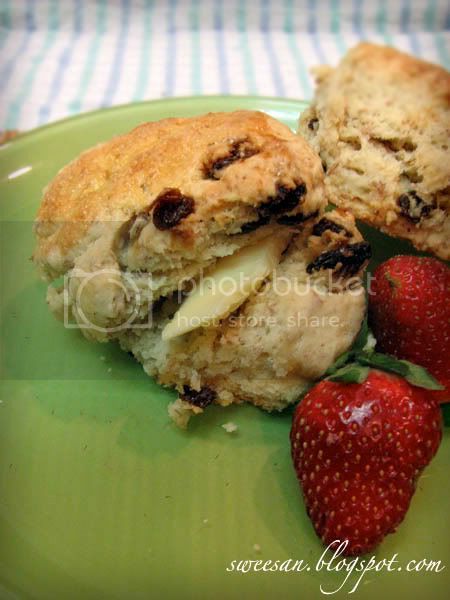 The scone is a basic component of the cream tea or Devonshire tea. How do u like your scones? with butter? jam? clotted cream? or plain? and when do you prefer to eat them? as breakfast or as tea time snacks? Regardless time or whichever condiment it’s paired with, I do think that people who don’t like to eat cakes, like to eat scones. I may be wrong but I’ve came across quite some people who are like that. Maybe it’s a healthier version ? To make scones, it’s better if the butter is extra cold and everything else is cold or chilled. That will give the scone a nice height and shape when it’s baked and a good texture. 1. Cut butter to small pieces and toss together with dry ingredients (flour, all purpost flour, wholemeal flour, sugar, baking powder and salt) Put in the freezer for 15 minutes to chill the butter. 2. Remove bowl and start rubbing the butter and flour to make it crumbly. Or pulse in food processor to resemble course crumbs. 3. In a seperate bowl, mix egg and soy milk together. Gradually pour into the crumb mixture and mix till it forms a soft dough. Toss in raisins and knead it in lightly. 4. Dust some flour on a surface and knead the dough making sure it forms a ball. Pin out dough with a rolling pin to about 1/2 inch thick. Cut out using round cutters or use a knife and cut them into triangular shapes. 5. Place them on a baking pan, brush surface of scones with egg wash and toss some caster sugar over the top. Bake at 190 C for about 15 minutes or till brown. Serve while hot. i love scones! will love a try on this.